A 38 year old woman presented with female hair loss. 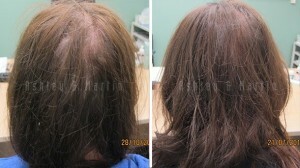 This included topical thinning throughout the top, sides, and back of her scalp. The hair strands had also become significantly thinner. The hair loss had been occurring for about 12 months. The loss had slowly been increasing over this time. The patient’s husband had initially noticed the problem, supportively prompting her to seek treatment. The patient was diagnosed with Telogen Effluvium. This was diagnosed through the visible signs of loss, as well as the pattern of loss over the time frame. The patient had inquired about a solution for hair thinning, for which Ashley and Martin could offer hair regrowth treatment. The patient was provided with a LaserCap. The medical device was to be used as a treatment for hair fall, as well as a solution to grow her hair back. Although patient did not show signs of advanced hair loss, she understood treating it early would result in the best outcome. The patient was also given Ashley and Martin’s Hair Nutrient Complex multivitamin. This was recommended to be taken once daily with food, for the duration of at least 12 months. Over a 9 month period, the patient’s hair significantly improved throughout the top, sides and back. The hair became healthier, hair regrowth had become visible, and the overall density had increased. The back of the scalp had fully regrown. The patient had also noticed the hair shafts had become thicker, to what it previous was before the loss began to occur. Both the patient and her husband are very pleased with the results. The patient will continue treatment for now, as more improvements are to be expected. This is due to the time frame of treatment having only occurred for 9 months.